A special benefit performance of A.R. 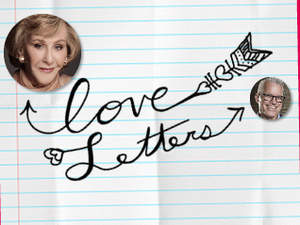 Gurney's play "Love Letters,"in celebration of love, friendship, and the lost art of letter writing. This uniquely imaginative piece offers theater at its most simple yet most compelling, consisting only of two people reading the letters exchanged over a 50-year friendship. Yet from childhood birthday parties and sleepaway camps through the first halting steps into adulthood to the promise and pitfalls of professions, families, and responsibilities, we follow childhood besties Andrew and Melissa on the bumpy but fulfilling road of Life—in which they share, in writing and with sometimes startling frankness, almost every up and down along the way. And who better to bring to life this longtime friendship—with all its honesty and abundant humor—than notorious pals Michael Ross, Executive Director of Baltimore Center Stage, and Rhea Feikin, the "First Lady" of Maryland Public Television: anchor of "Artworks" and host of "Chesapeake Collectibles." Admission $100. Includes a Champagne and Dessert reception following the performance.